gives the impression that much effort has been put into what is shown on the screen. the background of tree part is quite cool. a nice demo. Some great logos and effects. Very refreshing in parts! GFX, music and timing are nice. What everyone else said. Props for clean-looking visuals in textmode. despite the dull music, this was BY FAR the best looking tmdc contribution this year. Nice style, only the city let it down a little. Tune rules. I overly enjoyed it. Clean looking stuff. Great music. I love it! This is how textmode should be done! 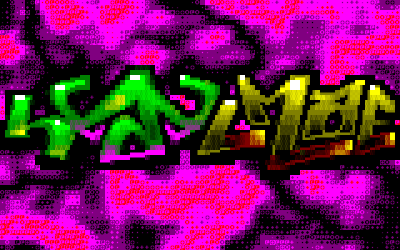 The music and ANSI art set this demo apart. i never thought i'd say this again, but that is a very nice fire effect. horrible music, nice graphics and totally wtf:ish design.. the tune was utterly, totally the most clichey extra-cheezy scenetune i've ever heard, but codewise this is apparently very well done. so a piggie. It looks very, very nice and smooth. Good prod, bad tune. Rulez anyways. the 2D (plasma/fire effect/smoke/etc) was really really nice, the 3D parts looked a lot less pretty though. Amazing! thought 2MB is a bit large, still very nice demo! rulez added on the 2009-12-21 13:42:38 by ɧ4ɾɗվ. burning Asc11 flames is very smart, I'like zik too ! Excellent music and very nice tunnel/plasma/fire efects. damn saw this thing so many times and not thumb? thanks metapouet! page created in 0.017335 seconds with 15 queries.